Phil Stebbing (blue) scores for Yaxley against Harborough. Photo: David Lowndes. Peterborough Sports survived to fight another day in the FA Cup by grabbing an equaliser when down to nine men in their preliminary round tie at Eynesbury Rovers today (August 19). 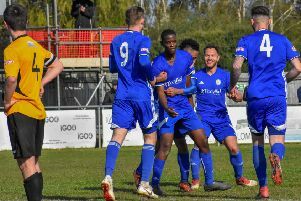 The higher-level city side looked dead and buried when Eynesbury, a team tipped by many to succeed Sports as United Counties Premier Division champions, took the lead from the penalty spot on 64 minutes not long after Ash Robinson had been sent off for serious foul play. Action from Yaxley's 5-3 win over Harborough in the FA Cup at In2itive Park. Photo: David Lowndes. Worse was to follow as David Femiola was dismissed for picking up a second caution, but Sports played better with nine men than 11 and a rash 90th minute tackle on Josh Moreman enabled Jamie Graham to equalise from the penalty spot. The teams will replay at PSL on Tuesday (August 22, 7.45pm). Wisbech and Spalding will also replay on that night after a cracking 2-2 draw at the Fenland Stadium today. Higher level Spalding scored early through Jack Fixter, but Wisbech fought back to grab the lead thanks to goals from former Tulips Michael Frew and Adam Millson. Action from Yaxley's (blue) FA Cup win over Harborough/ Photo: David Lowndes. But Cenk Acar struck late on for Spalding to earn a replay at the Sir Halley Stewart Field. But Deeping Rangers, Yaxley and Holbeach are all through to the first qualifying round. Goals from Scott Mooney and Luke Avis enabled Deeping to come from behind to win 2-1 at crack step four outfit Barton Rovers, while Tom Waumsley and Matt Sparrow both scored twice to help Yaxley to a 5-3 win over Harborough Town at In2itive Park. Holbeach beat ON Chenecks 3-0 at Carter’s Park in a UCL Premier Division game last week and they improved on that in their FA Cup tie at the same venue today. Mitch Griffiths (2), Lewis Leckie (2), Spencer Tinkler and Will Bird were on target in a 6-1 win. Last season Stamford AFC battled all the way to the first round proper before losing to Hartlepool United, but they were knocked out early this season, 1-0 at Cambridge City. Daniels’ boss Graham Drury was irritated by decisions going against his side, notably a red card for defender Mike Armstrong. The draw for the first qualifying round takes place on Monday (August 21). FA Cup preliminary Round: Cambridge City 1, Stamford 0. FA Cup preliminary Round: Eynesbury Rovers 1, Peterborough Sports 1 (Graham); Wisbech Town 2 (Millson, Frew), Spalding United 2 (Fixter, Acar); Barton Rovers 1, Deeping Rangers 2 Mooney, Avis); Holbeach United 6 (Leckie 2, Griffiths 2, Keeble, Bird, Tinkler), Northampton ON Chenecks 1; Yaxley 5 (Waumsley 2, Sparrow 2, Stebbing), Harborough 3.